Labyrinth is a 68 mile flat water section of the Green that is popular as a 4-6 day canoe trip, but also is commonly floated in rafts and inflatable kayaks. The canyon scenery is stunning, and this section of river is fantastic for bird watching. Towering sandstone walls of orange and reddish brown line the river corridor, and side canyons make for interesting hiking. There are petroglyphs and more recent etchings from explorers and mountain men who first explored this canyon. Due to the quiet nature of this trip, opportunities for viewing wildlife abound. This is a great trip for anyone nervous about river travel. 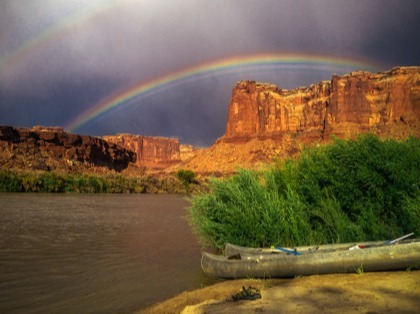 Stillwater is a 52 mile flat water section of the Green River that is often floated in combination with Labyrinth Canyon. 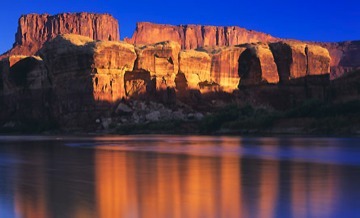 It runs through Canyonlands National Park and ends with the confluence of the Colorado river, and takes 3-6 days to float. Amazing red rock formations and Ancient Puebloan ruins and rock art sites make this a magical journey. Hiking opportunities are fabulous, as the river allows you access to some very remote areas of Canyonlands National Park. Due to the quiet nature of this trip, opportunities for viewing wildlife abound.